As I mentioned recently, I’ve been playing around with pork recipes. I’m trying to get back into cooking and sharing those recipes with y’all… but also, these happened to come out sooooooo good, it’s mean not to share, after I tormented all y’all who follow me on Twitter/Instagram/Facebook with the photos. 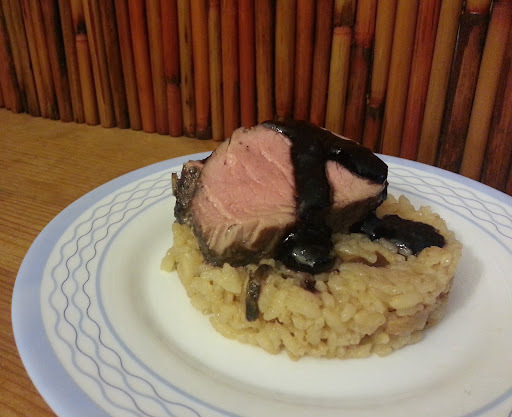 The first pork dish I made was a blueberry sage glazed pork tenderloin over shiitake risotto. 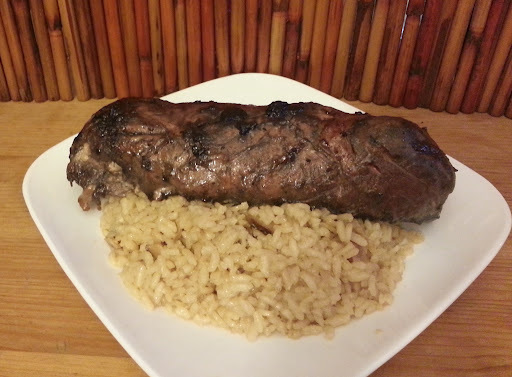 I bought a pork tenderloin at Trader Joe’s, for around $5-6 for the whole thing. *Though I had $5 off fresh pork coupon from the National Pork Board, so it came out to much less. Look at how tender and juicy that pork looks! I served it with a bit of the glaze drizzled on top for a pump of the flavor – don’t worry, I didn’t contaminate it with raw pork. Some of you may be saying that my pork is undercooked and dangerous to eat. *shakes head emphatically* No. I temped it, and recent USDA regulations have changed. It’s now recommended that you cook pork to 145 degrees (USE A THERMOMETER!!! Everyone should have one in the kitchen, savory or pastry cooks alike), with a 3 minute rest time. And a few days later, I sliced up some pork for a sandwich, using the glaze as a spread, along with some juicy orange tomatoes and served with some pickles. If my knife skills were better, I’d have been able to slice the pork more thinly, but I’m still waiting for someone to gift me a knife skills class for Christmas… ahem. Heat all of the ingredients in a saucier… sorry I forgot to take measurements again… and reduce until it coats the back of a spoon. Taste it too – but try not to eat it all which is what I almost did – and make sure the flavor is something you like. Meanwhile, preheat your oven to 450. 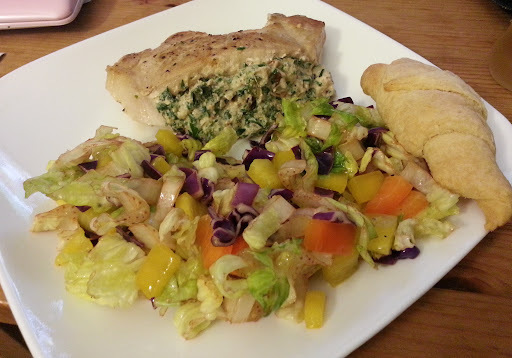 I used my toaster oven… it preheats so fast and is perfect for small meals like this. In the summer, it doesn’t overheat the apartment either… though I guess in the winter, using the oven adds a nice toastiness to the place, haha. Rub the tenderloin with olive oil, then spoon glaze over the top. Don’t let the spoon touch the raw pork or anything that touches the raw pork get into the glaze because that would contaminate it. Brush the glaze all around the tenderloin with a pastry or BBQ brush. Roast for 15-20 minutes. Mine cooked for about 17-18 minutes before hitting 145, and then I let it rest. It was the perfect shade of cooked, juicy, tender, and delicious; the glaze adds a subtle sweetness to complement the pork taste. I served it over shiitake risotto with more glaze; the shiitakes were super savory, so they balanced everything together just right. In the bottom of a skillet, heat olive oil. Once hot, add onions and garlic. Cook till fragrant, then add spinach and sundried tomatoes, allowing to heat through. Meanwhile, in a bowl, mix together the cream cheese, ricotta, lemon zest, lemon juice, nutmeg, sage and walnuts. Let the spinach mixture cool a little before adding to bowl and mixing together till homoegenous. Prepare the pork chops: cut slits into one side to form pockets – do not cut all the way through. Add a tablespoon or so of stufing – not too full or it will all just leak out or burst out while you cook the pork chops. Heat skillet – I used the same one I’d cooked the spinach/onion/garlic in because I’m lazy, haha. Cook for about 4 minutes on each side, until golden brown. I served with a simple salad and a crescent roll, but you could serve it with anything you like – rice or mashed potatoes, which would be nice mixed in with the parts of the stuffing that ooze out. I also had leftover “stuffing” so I ate it like a healthy spread/dip on crackers and celery sticks… yum! 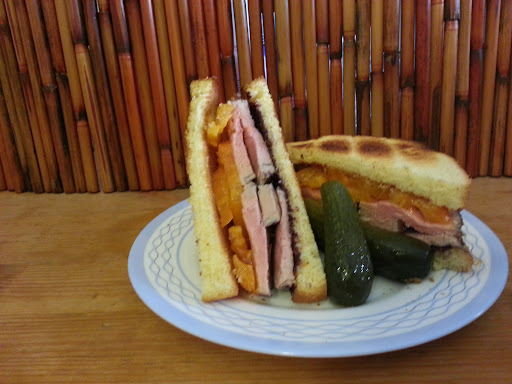 Or a really nice sandwich spread… mmm. Happy eating! What’s your favorite way to eat pork? Aside from bacon. Favorite ways are italian Sausage especially on hero or on pizza, the meat filling in dumplings, roast pig and BBQ spare ribs. DROOLzzZ. Ooh, all good ways to enjoy pork… ways that I wouldn’t even think about normally as eating pork, haha. Yum!!! I just love pork ribs cooked all different ways: black bean and garlic at dim sum, roasted in Chinese BBQ, slow cooked in American BBQ, etc etc. However, I do enjoy a piece of pork tenderloin a lot as well since it’s very flavorful yet lean at the same time. Super east to work with as well. Ooh, I just bought some pork ribs today… not sure yet what I’m going to do with them, but they went straight into the freezer. Mmm, yummy.